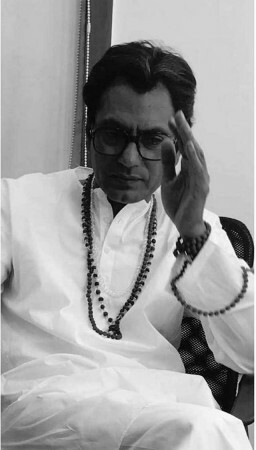 Acclaimed Bollywood actor Nawazuddin Siddiqui will play the title role of the late Shiv Sena founder-president Bal Thackeray in the upcoming biopic titled "Thackeray". Bollywood megastar Amitabh Bachchan, Shiv Sena President Uddhav Thackeray, and Shiv Sena MP Sanjay Raut attended the glittering launch function here on Thursday evening. The first promotional posters of the Hindi biopic - to be directed by Abhijit Panse - was unveiled by Uddhav Thackeray amidst a thunderous applause. Terming Bal Thackeray as "an unparalleled leader of the masses," Raut - who has scripted the film for nearly four years - exuded confidence that the film would prove popular with the mainstream audiences. "I had spent much time with Balasaheb, and associated with him for nearly four decades. I have a deep knowledge of his life and there are many aspects which shall be brought forth in the film," he said. Bal Keshav Thackeray, the charismatic cartoonist-turned-firebrand politician founded the Shiv Sena and had a gigantic presence in Maharashtra and national politics for over five decades. He passed away in 2012 aged 86.